In his State of the Union address, Barack Obama proposed that every child in America have free access to early childhood education (pre-K). In essence, he wants to extend the government's support of free education for all citizens from K-12 to Preschool-12. Back in 1965, the controversial Head Start program was created to fill this need, with a focus on disadvantaged children, but it has been poorly managed and poorly executed. As is often the case with State of the Union proposals, there was no plan for how to finance what would be the largest expansion of public education in decades. Even so, people are lining up to support it, including conservative New York Times columnist David Brooks (The Social Animal). It's not likely that other conservatives will line up behind Brooks - few others possess his interest in and knowledge of psychology, neuroscience, and the role of culture in human development. Today millions of American children grow up in homes where they don’t learn the skills they need to succeed in life. Their vocabularies are tiny. They can’t regulate their emotions. When they get to kindergarten they’ve never been read a book, so they don’t know the difference between the front cover and the back cover. But, starting a few decades ago, we learned that preschool intervention programs could help. The efforts were small and expensive, but early childhood programs like the Perry and Abecedarian projects made big differences in kids’ lives. The success of these programs set off a lot of rhapsodic writing, including by me, about the importance of early childhood education. If government could step in and provide quality preschool, then we could reduce poverty and increase social mobility. Fortunately, that is not the end of the story. Over the past several years, there’s been a flurry of activity, as states and private groups put together better early childhood programs. In these programs, the teachers are better trained. There are more rigorous performance standards. The curriculum is better matched to the one the children will find when they enter kindergarten. These state programs, in places like Oklahoma, Georgia and New Jersey, have not been studied as rigorously as Head Start. There are huge quality differences between different facilities in the same state or the same town. The best experts avoid sweeping conclusions. Nonetheless, there’s a lot of evidence to suggest that these state programs can make at least an incremental difference in preparing children for school and in getting parents to be more engaged in their kids’ education. These programs do not perform miracles, but incremental improvements add up year by year and produce significantly better lives. Enter President Obama. This week he announced the most ambitious early childhood education expansion in decades. Early Thursday morning, early education advocates were sending each other ecstatic e-mails. They were stunned by the scope of what Obama is proposing. So far the news is very good. Obama is trying to significantly increase the number of kids with access to early education. The White House will come up with a dedicated revenue stream that will fund early education projects without adding to the deficit. These federal dollars will be used to match state spending, giving states, many of whom want to move aggressively, further incentive to expand and create programs. But Washington’s main role will be to measure outcomes, not determine the way states design their operations. Washington will insist that states establish good assessment tools. They will insist that pre-K efforts align with the K-12 system. But beyond that, states will have a lot of latitude. Should early education centers be integrated with K-12 school buildings or not? Should the early childhood teachers be unionized or certified? Obama officials say they want to leave those sorts of questions up to state experimentation. “I’m just about building quality,” Education Secretary Arne Duncan told me. The goal is to make the federal oversight as simple as possible. That’s crucial. There’s still a lot we don’t know about how to educate children that young. The essential thing is to build systems that can measure progress, learn and adapt to local circumstances. Over time, many children will migrate from Head Start into state programs. This is rude to say, but here’s what this is about: Millions of parents don’t have the means, the skill or, in some cases, the interest in building their children’s future. Early childhood education is about building structures so both parents and children learn practical life skills. It’s about getting kids from disorganized homes into rooms with kids from organized homes so good habits will rub off. It’s about instilling achievement values where they are absent. A version of this op-ed appeared in print on February 15, 2013, on page A27 of the New York edition with the headline: When Families Fail. Even the professional understanding of quantum mechanics is "embarrassing", says cosmologist Sean Carroll. We filmed with Sean during his visit to the University of Nottingham and will have more videos with him coming soon. It's been close to a century since we established how quantum mechanics "works," and we still don't know what it really means — and that, says cosmologist Sean Carroll in the video up top, may make QM the most embarrassing subject in all of modern physics. What's embarrassing, says Carroll, isn't that there remain unanswered questions about quantum mechanics, or that there's debate within the physics community regarding its significance. In science, uncertainty, skepticism and deliberation participate in a powerfully deductive dialectic that enables us to rework our understanding of nature — to step back from what we think we know, re-assess our preconceived notions, and bring forth newer, more fully formed views of our Universe. This notion — that science advances not in spite of uncertainty, but because of it — is precisely why Stephen Hawking bet against the discovery of the Higgs Boson. In physics (as with pretty much any scientific field), unanswered questions and internal debate are, almost invariably, wellsprings of progress. Not so with quantum mechanics, says Carroll, who claims that what's truly embarrassing about the physics of the very small is that questions surrounding its significance have gone unanswered for some 80 years, "with very little... immediately demonstrable progress, even though it's such an important question." "It seems to me that we have not been been trying to answer this question with as much vigor as we should," Carroll continues. 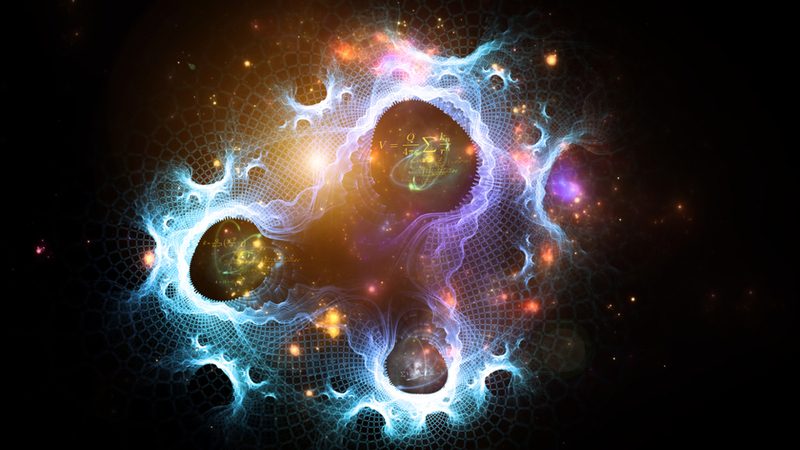 "What is quantum mechanics, really? I mean, that's like saying 'what is the Universe?' What more important question is there than that?" At just shy of 15 minutes, this video's a bit long for anyone with an attention span conditioned by the internet, but we highly recommend watching the whole thing. Carroll's explanations are lucid and intriguing, and the points he levels are compelling without being condescending. All-in-all, it's as good an introduction to QM as it is an exploration of the present state of the field. For more, check out Carroll's blog entry on the subject of QM-as-embarrassment over at Preposterous Universe. From Smithsonian Magazine, a psychological and anthropological analysis of the subjective, culturally-based nature of time and its measurement. “What time is it?” is not a question that usually provokes a lot of soul-searching. It’s generally taken for granted that even if we don’t know the correct time, a correct time does exist and that everyone on the planet—whatever time zone they happen to be in—follows the same clock. University of Missouri management scholar Allen Bluedorn believes time itself is a social construction. “What any group of people think about time ends up being a result of them interacting with each other and socialization processes,” he says. We measure time not simply in terms of minutes and seconds, but in terms of concepts such as “early,” “late”—or, for that matter, “fashionably late.” What is the length of a “work day”? In the United States, Europe and Japan you’ll get three different answers. Those subjective views help explain why the standardization of time has often been met with reluctance, if not outright resistance. Historically, countries have not eagerly embraced the global clock—they’ve felt compelled to do so because of the demands of commerce. The U.S. national time standard, for instance, didn’t emerge until 1883, when it was adopted by the railroads, which needed to maintain common timetables. Before that, cities largely kept their own local time, and many were not happy to have big government and big railroads force standardization on them. “Let the people of Cincinnati stick to the truth as it is written by the sun, moon and stars,” editorialized one newspaper when the changeover was going into effect. The era of globalization may be finishing the job, as information technology and the international supply chain knit nations together more tightly than ever. But while it’s possible to synchronize clocks, synchronizing cultures has proven more challenging. One commonly recounted example is a group of American bankers in Mexico who found that their Mexican colleagues were frequently scheduling meetings for hours after they planned to head home for the day. The famed American anthropologist Edward T. Hall argued that many of these differences are based upon whether a country is “mono- chronic” or “polychronic.” In monochronic societies, including Europe and the United States, time is perceived as fixed and unchanging, and people tend to complete tasks sequentially. In polychronic societies, including Latin America and much of Asia, time is more fluid and people adapt more easily to changing circumstances and new information. California State University social psychologist Robert Levine conducted an experiment to determine the “tempo” of 31 countries, using measures such as the efficiency of local post offices and the accuracy of public clocks. He found that Switzerland, Ireland and Germany were the fastest countries while Mexico, Brazil and Indonesia were the slowest. But how long will these cultural differences persist? Will trade and globalization iron them out as effectively as the railroads did away with Cincinnati’s proud city time? Rupert Sheldrake talks about his newest book, Science Set Free: 10 Paths to New Discovery (or the UK version, The Science Delusion: Freeing the Spirit of Inquiry, which is where the title of the TEDx talk comes from), at TEDxWhitechapel. The science delusion is the belief that science already understands the nature of reality, in principle. The fundamental questions are answered, leaving only the details to be filled in. The impressive achievements of science seemed to support this confident attitude. But recent research has revealed unexpected problems at the heart of physics, cosmology, biology, medicine and psychology. Dr Rupert Sheldrake shows how the sciences are being constricted by assumptions that have hardened into dogmas. Should science be a belief-system, or a realm of inquiry? Sheldrake argues that science would be better off without its dogmas: freer, more interesting and more fun. Rupert Sheldrake, Ph.D. is a biologist and author of more than 80 scientific papers and 10 books, including The Science Delusion. He was a Fellow of Clare College, Cambridge University, a Research Fellow of the Royal Society, Principal Plant Physiologist at ICRISAT (the International Crops Research Institute for the Semi-Arid Tropics) in Hyderabad, India, and from 2005-2010 the Director of the Perrott-Warrick Project, funded from Trinity College, Cambridge. He is a Fellow of the Institute of Noetic Sciences, Petaluma, California, and a visiting professor at the Graduate Institute in Connecticut. His website is www.sheldrake.org. Charles Eisenstein speaks about a New Story of the People at the TEDxWhitechapel event. 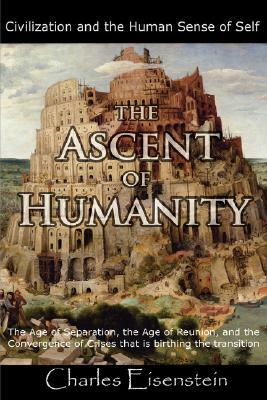 Eisenstein is the author of Sacred Economics: Money, Gift, and Society in the Age of Transition (2011) and The Ascent of Humanity: Civilization and the Human Sense of Self (2013, reissue). This young man (he's roughly my age, since he is also born in 1967) is a rising star in the intellectual world, and this talk gives a little glimpse of why this is true. "Our hearts know that a more beautiful world is possible; but our minds do not know how it's possible". In this intelligent and inspiring talk, writer and visionary Charles Eisenstein explores how we can make the transition from the old story of separation, competition and self-interest to a new Story of the People. His books (The Ascent of Humanity and Sacred Economics) as well as his other essays and blog posts on web magazines have generated a vast online following; he speaks frequently at conferences and other events, and gives numerous interviews on radio and podcasts. Writing in Ode magazine's "25 Intelligent Optimists" issue, David Korten (author of When Corporations Rule the World) called Eisenstein "one of the up-and-coming great minds of our time." Eisenstein graduated from Yale University in 1989 with a degree in Mathematics and Philosophy, and spent the next ten years as a Chinese-English translator. He currently lives in Harrisburg, Pennsylvania with his wife and three sons. "No one graduates from the Eightfold Path; living well is an ongoing process." Exactly, and this essay offers a basic outline for using the Eightfold Path of Buddhism as a moral compass, a philosophy for living. The Eightfold Path tends to be divided into three inter-related divisions: Wisdom (Right view, Right intention), Ethical Conduct (Right speech, Right action, Right livelihood), and Mental Development (Right effort, Right mindfulness, Right concentration). Often, each of the paths is depicted as a spoke in a wheel, with the hub of the wheel sometimes suggested to be the illusory self in some Western Buddhist Psychology models. Irwin, W. (2013, Jan). Journal of Philosophy of Life, Vol. 3(1):68-82. In this essay I offer my interpretation of the Buddhist Eightfold Path as a philosophy of life, beginning with discussion of right views concerning suffering, liberation, compassion, and kindness. Compassion and kindness are virtues that direct us away from ourselves and our craving, and thus free us from suffering. The goal of right thought is to have only the kinds of thoughts we want to have. Right speech is practiced in words that express compassion and kindness. Right action calls us to be slow to react, and thoughtfully do the next right thing. Right livelihood means that any work that directly or indirectly causes others to suffer is work to avoid. Right effort recognizes that we live well only with effort. Right mindfulness is doing one thing and thinking only of it. Right concentration — clearing the mind in meditation — is both the culmination and the second beginning of the Eightfold Path. No one graduates from the Eightfold Path; living well is an ongoing process. Psychiatrist and author Iain McGilchrist, whose most recent book is The Master and His Emissary: The Divided Brain and the Making of the Western World, and the Director of RSA’s Social Brain Centre, Dr Jonathan Rowson, have joined forces to write Divided Brain, Divided World; Why the best part of us struggles to be heard. This document grew out of a workshop given in November the mark the evolution of The Social Brain Project into The Social Brain Centre. McGilchrist and Rowson explore the practical significance of our two brain hemispheres having radically different "world views." For a detailed synopsis to the report, Jonathan Rowson posted an introduction of sorts a few days ago, which is here. I'll share a little of it below. 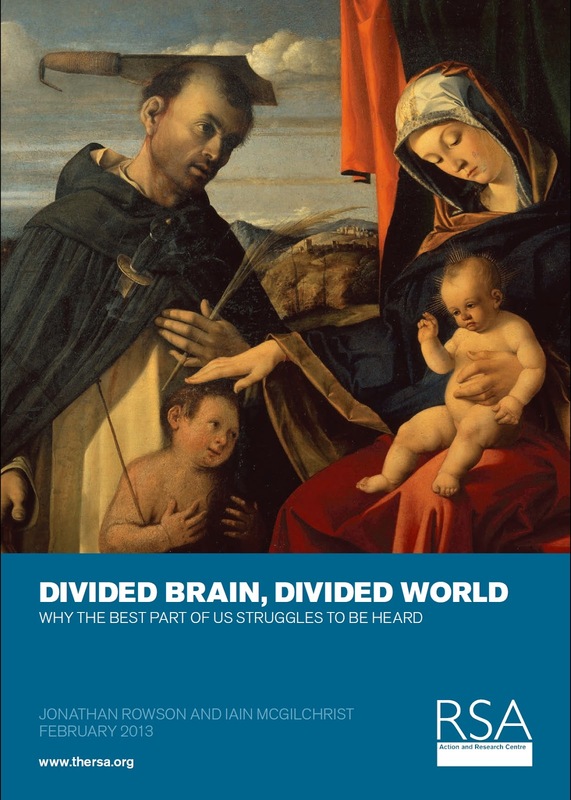 Divided Brain, Divided World; Why the best part of us struggles to be heard explores the practical significance of the scientific fact that the two hemispheres of our brains have radically different ‘world views’. It argues that our failure to learn lessons from the financial crash, our continuing neglect of climate change, and the increase in mental health conditions may stem from a literal loss of perspective that we urgently need to regain. The evidence-based case is that the abstract, articulate, instrumentalising world view of the left hemisphere is gradually usurping the more contextual, holistic but relatively tentative world view of the right hemisphere. Divided Brain, Divided World examines how related issues are illuminated by the ideas developed in author and psychiatrist Iain McGilchrist’s critically acclaimed work: The Master and His Emissary: The Divided Brain and the Making of the Western World. It features a dialogue between McGilchrist and Director of RSA’s Social Brain Centre, Dr Jonathan Rowson, which informed a workshop with policymakers, journalists and academics. This workshop led to a range of written reflections on the strength and significance of the ideas, including critique, clarification and illustrations of relevance in particular domains, including economics, behavioural economics, climate change, NGO campaigning, patent law, ethics, and art. You see, the book is magisterial, and the argument utterly fundamental, so anybody who spends their time trying to effect social change should at least be aware of it, and have some sense of what they feel or think about it. You can think of it as a grand theory for our times. The argument is pitched at too general a level to ever reflect a single direct cause of a single phenomenon, but once the narrative as a whole seeps into you, it feels like it is relevant to everything around us, and you want everybody else to be able to see the world through that lens. The creation of absurd forms of bibliometry and citation counting in higher education research assessment exercises. Funding cuts for arts and humanities courses that struggle to justify themselves in instrumental terms. Pervasive ignoring or denial of the scale of our climate change problem. Political failure to think through the implications of the fact that beyond a minimal threshold higher income does not equate with higher wellbeing. Political failure to question the imperative for economic growth. I really hope as many people as possible can read the full report. However, if you just press ‘print’, you’ll get about 48 pages double-sided, so it is worth thinking of what you most want to read by going to the contents page in the PDF first. The dialogue with me and Iain is split into three parts: 1) The argument (p 8) 2) Challenges to the argument (p 23) 3) Practical Implications (p 31). The Reflections section (p 51) includes 14 feedback pieces including Ray Tallis, Mark Vernon, Tom Crompton, Rita Carter, Theresa Marteau and others. The Appendices (p 80) feature details of a three-hour workshop discussion where Guy Claxton, Mark Williamson, Matthew Taylor and many others spoke, and has been included to capture some of the best ideas generated collectively, but will probably only be of interest to those who are truly committed! Another excellent Zen Brain conference hosted by Joan Halifax Roshi and the Upaya Zen Center. This yearly event always features excellent speakers and enlightening discussions. This year is no exception, with Al Kaszniak, Evan Thompson, Stephen Batchelor, Richard Davidson, and Joan Halifax all participating. All eleven segments (+1) are linked to below - you can listen for free at the Upaya site in exchange for an email address. Al Kaszniak received his Ph.D. in clinical and developmental psychology from the University of Illinois in 1976, and completed an internship in clinical neuropsychology at Rush Medical Center in Chicago. He is currently Director of the Arizona Alzheimer’s Consortium Education Core, and a professor in the departments of psychology, neurology, and psychiatry at The University of Arizona (UA. 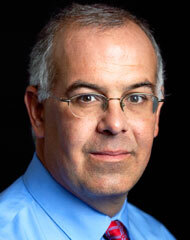 He formerly served as Head of the Psychology Department, and as Director of the UA Center for Consciousness Studies. Al also presently serves as Chief Academic Officer for the Mind and Life Institute, an organization that facilitates collaborative scientific research on contemplative practices and traditions. He is the co-author or editor of seven books, including the three-volume Toward a Science of Consciousness (MIT Press), and Emotions, Qualia, and Consciousness (World Scientific). In addition to his academic and administrative roles, he is a lineage holder and teacher (Sensei) in the Soto tradition of Zen Buddhism. In this session Dr. Al Kaszniak takes listeners through some of the ways that cognitive science and neuroscience have approached the study of consciousness. In this second panel discussion our presenters answer such guest questions as: difference between awareness and consciousness, is unconscious created externally, long term meditation and pain response, historical use of term consciousness. Dr. Thompson takes the listener on a cross-cultural fusion, neuro-phenomenology journey. He weaves Buddhist ideas from the Abhidharma, with work on the cognitive neuroscience of consciousness. During the Fri afternoon and evening panels. The Zen Brain faculty consider questions on “out of body” experiences, embodiment and direct experience, Indian writings on interoception, lucid dream states, consciousness as a layered phenomenon, the mind and life meeting held in monastery in India attended by 10000 monks, relationship between attention and consciousness. In this presentation, Stephen Batchelor considers two questions: What was the Buddha trying to do? and How does consciousness fit in? His draws on the Pali canon but not any particular school of buddhism. During this session the Zen Brain faculty answer questions about the concepts: rebirth, fully knowing, mindful awareness, yoni awareness & Dogen, near death experience. store consciousness and memory. 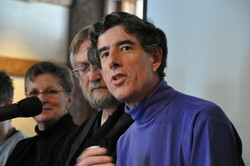 In this presentation, Richard Davidson explores three of the major topics of the seminar: waking, sleeping, and dying. Richard orients the presentation specifically to the intersection of Neuroscience and contemplative practice. Richard begins the presentation by taking offering the audience a visual contemplative journey through the beautiful complexity of the brain. This video can be found here (or direct URL : http://smithlab.stanford.edu/Smithlab/AT_Movies.html ), titled “Machinery of Mind.” Richard goes on to identify particular phenomena of contemplative practice that are currently being investigated by neuroscientists. He then discusses recent findings of this exciting work. During our Saturday afternoon session, our faculty respond to questions about the scientific and subjective significance of near death experience and the continuity of consciousness after death. Also, Richard comments on the differences he has measured between different styles of meditation, and he further discusses the implications of contemplative science in the health care fields. This is the final day of Zen Brain. This podcast includes the reflections of the faculty on their own personal way of coming to grips with what has been talked about during these days. This is the final day of Zen Brain. This last session contains participant reflections on what they are taking from this time, what is most relevant to them, what are the implications for what they do and what does all this have to do with practice. Robb Smith, social entrepreneur, co-founder of Chrysallis, and co-founder of Integral Life, discusses how we must learn how to live a transformational life if we want to thrive in the complex world we all now inhabit. State of the Union speeches have become lofty in their aspirations for the country, and impotent as an impetus to real change. 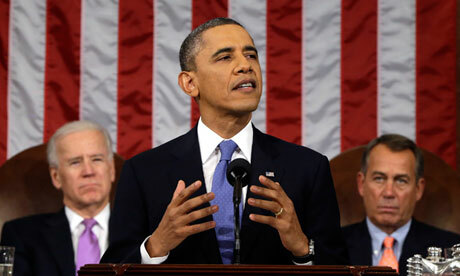 Such was last night's fifth State of the Union speech from President Obama. However, the folks at Think Progress have identified six ideas from Obama's speech that they consider "game changers." Sadly, I suspect none of them will ever come to fruition, not even the one that seems most likely to be supported by both parties - putting people to work repairing the nation's crumbling infrastructure. This series of videos from Evan Thompson on the topic of neuroscience and free will was brought to my attention by the Integral Postmetaphysical Enaction blog (a great blog, by the way). I embedded all six sections of the video into this playlist, so they all play back to back. The post at IPE breaks down some of the argument Thompson presents, and I wanted to mention one part of it that is in sync with my own views on free will (or, more likely, my views are in sync with Thompson's, since he is the expert). From part 1, quoting William James: ""Effort of attention is thus the essential phenomenon of will" (7:10). From the conclusion of part 6: "Free will then is not exempt from causes and conditions but is rather the flexible coordination of attention" (4:05). In part 2 he starts to talk about the self related to meditation (around 7:00). Around 7:45 he notes it has 2 aspects, the present-centered "I" and the narrative self which adds past and future. He relates it to Damasio's ideas. I recommend you go read the rest of the summary - it goes into the work of Antonio Damasio and his four stages of self. The part that I agree with completely, and have been arguing in various ways for years (contra Sam Harris), is that free will is a product of attention. When we learn, through mindfulness, to pay attention to our thoughts, our feelings, our impulses, then we can begin to truly exhibit free will. Otherwise, we are simply creatures acting out of habit and unconscious needs. This brief article comes from the Metanexus blog. The author looks at new research that suggests people can see that they have changed over the last ten years, but at the same time they assume they will change little in the next ten years. People seem to believe they will stay as they are in this moment for the remainder of their lives. Or was it this moment, or this one . . . .
Are you done changing? Are your values and personality pretty much set for life? Regardless of our age, most of us seem to think so. While the researchers are clearly speaking of the history of the individual, their research raises the question of whether there’s a similar illusion when it comes to human history. For example, do we routinely underestimate the amount of technological change that lies ahead or its cultural and social impact? We acknowledge the profound cultural changes in past decades, but do we underestimate what is coming? We marvel at the transformations of human evolution, but do we fail to imagine the changes that lie ahead? According to the researchers, "people may confuse the difficulty of imagining personal change with the unlikelihood of change itself." If that is true of the human individual, might it also be true of the human species? A version of this post first appeared on Enhancing Theology. This is not new information - infants have been known to die as a result of no touch or affection, a phenomena first studied in orphanages following World War II, and codified by John Bowbly by request of the U.N. Bowlby's work paralleled that of his contemporary, René Spitz, who observed children's grief at being separated from caregivers, and he proposed "that "psychotoxic" results were brought about by inappropriate experiences of early care." However, to see the actual brain scans of nurtured children versus those subjected to neglect is startling and, as the headline suggests, chilling. A shocking comparison of brain scans from two three-year-old children reveals new evidence of the remarkable impact a mother's love has on a child's brain development. (Photo : Bruce D. Perry, M.D., Ph.D./Child Trauma Academy) Neurologists say that the sizeable difference between these two brains of two different 3-year-olds has one primary cause: the way that their mothers treated them. The chilling images reveal that the left brain, which belongs to a normal 3-year-old, is significantly larger and contains fewer spots and dark "fuzzy" areas than the right brain, which belongs to that of a 3-year-old who has suffered extreme neglect. Neurologists say that the latest images provide more evidence that the way children are treated in their early years is important not only for the child's emotional development, but also in determining the size of their brains. Experts say that the sizeable difference in the two brains is primarily caused by the difference in the way each child was treated by their mothers. While at first glance, the images might indicate that the child with the right brain might have suffered a serious accident or illness, neurologists said that the truth is that the child with the shrunken brain was neglected and abused by its mother, and the child with the larger and more fully developed brain was raised in a loving, supportive home and was looked after by its mother, according to The Sunday Telegraph. Researchers told the UK newspaper that the image of the brain scan on the right shows that the child lacks some of the most fundamental areas that are present in the image of the brain scan on the left. They say that the child on the left with the larger brain will be more intelligent and will be more likely to develop the social ability to empathize with others compared to the child on the right. On the other hand, the child with the smaller brain on the right will be more likely to become addicted to drugs, be involved in violent crimes, be unemployed and dependent on government benefits in the future. Professor Allan Schore from the University of California, Los Angeles (UCLA) said that in the first two years, babies rely on a strong bond with their mothers for healthy brain development. "The development of cerebral circuits depends on it," he said, adding that because 80 percent of brain cells grow in the first two years of life, problems in that development can affect people for the rest of their lives. Furthermore, researchers said that the more severe the mother's neglect, the more pronounced the brain damage can be. The latest study supports research released earlier this year that showed that children brought up by mothers who provide love and affection early in life are smarter and have a greater capacity to learn. Researchers at Washington University School of Medicine in St. Louis, found that children whose mothers nurtured them early in life have a larger hippocampus, a key brain structure that is essential to learning, memory and response to stress, according to a study published in the Proceedings of the National Academy of Sciences Early Edition. Can Images Unlock the Mystery of a Healing Brain? Maybe. Maybe not. But they can offer pathways for investigation. This article comes from MedPage Today. Reports that sophisticated imaging had revealed residual brain activity in former Israeli prime minister Ariel Sharon, who's been comatose for more than 6 years, focused on the spectacular technology involved, but overlooked a more important clinical story -- that some patients with severe brain injury actually do regain some degree of cognitive function. The concept of the minimally conscious state as a separate entity from the vegetative state has been a crucial diagnostic refinement in recent years, according to Nicholas D. Schiff, MD, who directs the Laboratory of Cognitive Neuromodulation at Weill Cornell Medical College in New York City. "In the past, these patients were all lumped together, until we started asking the question of why it should matter if some patients appear to have some awareness and ability to track although they can't speak, respond, or organize movements," he said. "Actually, it turns out that it matters a lot," Schiff told MedPage Today. What the brain imaging studies and neural research have demonstrated is that, in the weeks and months following brain injury, there is a vast difference in evolution of their condition between patients with minimal consciousness and those who are truly vegetative. "Recent studies have demonstrated that it is important to disentangle both clinical entities as functional neuroimaging studies have shown differences in residual cerebral processing and hence, conscious perception, as well as important differences in outcome," Schiff wrote online in the journal NeuroImage. What the research has begun to show is that recovery of important neural networks may be an occult process in some patients, with no visible changes in their ability to speak or move, he explained. In one program that has prospectively followed 400 patients with traumatic brain injury over the course of 5 years, a significant proportion of patients advanced at least to a minimally conscious state despite having initially been at the lowest level of the Glasgow coma scale. Approximately one-third of the patients regained some degree of independent function, and some even acquired vocational re-entry level of functioning, according to Schiff. One possible factor in the gradual return of consciousness after injury, sometimes over a long period of time, "is that the normal recovery process ... includes a component of structural remodeling that could plausibly relate to reestablishment of goal-directed behaviors and driving of learning and memory mechanisms," Schiff wrote in the December 2009 issue of Trends in Neurosciences. Following reports of spontaneous cognitive recovery after brain injury, a group of researchers from Cambridge, England, and Liege, Belgium, conducted a series of experiments in which they attempted to identify the level of awareness and the ability to communicate in 54 patients with severe brain injury. Functional MRI tests in healthy controls have shown that the same areas of the brain activated by motor and spatial tasks can also have increased blood flow when the person imagines doing an activity such as playing tennis or walking through a house. First, the researchers requested that the patients, while in the MRI scanner, imagine performing those activities. For patients whose functional brain scans revealed increased intensity in the motor cortex or parahippocampal gyrus, the researchers then increased the complexity of the task, asking a series of autobiographical questions that would have yes or no answers, such as if the patient had a brother named Tom. To answer yes, patients were instructed to imagine playing tennis, and to answer no, to imagine walking through the house. The hypothesis was that the motor area of the brain would light up with an affirmative response, while the parahippocampal area that reflects spatial function would show increased signal intensity with a negative reply. Among the 54 patients, five were able to "willfully modulate their brain activity," in response to the task instructions -- in effect, correctly answering the questions, wrote Martin M. Monti, PhD, now of the University of California Los Angeles. This proved that "in a minority of cases, patients who meet the behavioral criteria for a vegetative state have residual cognitive function and even conscious awareness," Monti and colleagues reported in the Feb. 18, 2010 issue of New England Journal of Medicine. But functional MRI is expensive and not always accessible, so another group tested 16 apparently vegetative patients using easily available electroencephalography (EEG) techniques and found that three were able to provide appropriate responses to commands that they imagine moving their hands and feet. The EEG results were equivalent to what is seen for healthy controls, Adrian M. Owen, PhD, of the University of Western Ontario, and colleagues reported in Nov. 10, 2011 issue of The Lancet. In effect, all these researchers were having simple conversations with their patients, Michael S. Beauchamp, PhD, of the department of neurobiology and anatomy at the University of Texas in Houston, told MedPage Today. Although the spectacular achievements being seen with neuroimaging have been garnering headlines, Schiff argued that another important need is far from being met. "What's missing is an articulated framework for tracking patients and translating what we're learning from the research side into a system of care where they are reassessed over time," he toldMedPage Today. Right now a person who is severely brain injured typically leaves the hospital with a diagnosis of vegetative state. There is no ICD code for minimally conscious state, no registry to follow these patients, and there is no requirement that the person undergo follow-up examinations. The heightened understanding that the brain can undergo recovery has not been incorporated into the system, according to Schiff. Follow-up assessments are not reimbursed by insurance companies, and there aren't even many centers that provide these services. The real hindrance has been this structural flaw in the system, he stated. Thus far the only progress has been made by the defense department, which has proposed -- although not yet implemented -- the establishment of polytrauma centers, where brain injured veterans will be provided with reassessment of levels of consciousness to allow for adjustments in treatment, Schiff explained. "As of now, it's very much the case that people just keep the diagnosis they were given when they leave the hospital," he said. That may not be of tremendous concern for a patient who has been comatose for 5 or 10 years. "But certainly a person who is minimally conscious after a couple of months can have a very wide range of outcomes, including some that might not be acceptable to many patients and others that would be acceptable to all," he said. Beauchamp concurred with the importance of differentiating patients who have no residual brain activity from those who may improve over time, particularly with regard to their treatment. "If someone is truly brain dead, and there's no brain activity at all, it's probably not worth investing tremendous time and effort in attempting to rehabilitate them. But if there is some brain function and they just have not been able to let you know, you would definitely want to try to help them," he said. And while it may be only up to 10% of comatose patients who have this minimal consciousness, it would be a tremendous service to provide more aggressive treatment to the one patient in 10 who does have potential for recovery, Beauchamp told MedPage Today. As to the implications of the brain scan results on prime minister Sharon, both Schiff and Beauchamp agreed that, while the specifics of the tests have not been publicly revealed, it seems unlikely that the treatment team found the types of responses seen in the published imaging studies, where patients were able to follow commands and perform other complex tasks. Imaging studies have also demonstrated that patients who are vegetative can have a considerable amount of ambiguous brain activity, such as apparently responding to one's name or to a familiar face. "The researchers who tested Sharon said they saw a response to his son's voice, but that's a lot simpler than being able to answer a yes or no question," Beauchamp said. "They were very careful not to speculate about any possibility of recovery," he added. "Animal studies also show that there is quite a lot of highly differentiated activity in the brain occurring without any conscious processing," Schiff noted. Accordingly, imaging tests such as those given Sharon are really not ready for prime time in the clinic, according to Schiff. In fact, they will probably not ever be useful as screening tests, because they aren't sufficiently sensitive. The false-negative rate is much too high, he said. The most important role for brain imaging in these patients is for confirming the presence of consciousness. "When the technology works it's an unambiguous rule-in test," Schiff said. That imaging tests remain imperfect tools for assessing consciousness was echoed by Stuart Hameroff, MD, director of the Center for Consciousness Studies at the University of Arizona in Tucson. "Imaging studies don't tell us about awareness, they tell us about neuronal activity, behavior, and perception, which may be conscious or nonconscious," Hameroff told MedPage Today. "Most people would say that consciousness is an emergent effect happening at a higher level of complexity, but my personal belief is that consciousness happens at a deeper level, inside the neuron, and is perhaps even a quantum effect," he said in an interview. What's most needed now is the adoption of a variety of tools not only including ever-advancing imaging technology but also skilled clinical examinations being done on a regular basis, to identify misdiagnoses and signs of recovery and adjust treatment as needed, according to Schiff. "We are trying to fundamentally understand what's happening when recovery occurs in a severely structurally damaged brain and to develop models of the underlying physiology, and then to develop rational therapies for those patients we can help," he concluded.